Hiiiii everyone! Sorry for the lack of posts over the past couple weeks. Ryan and I were in London for the last week of June, then it was Canada Day/4th of July, and things just kinda got away from me (read: I did as little as possible and loved every minute of it). I hope the lack of dessert in your inbox wasn’t too much of a disappointment! This is going to be another one of those posts where you will hopefully learn something from my mistakes. It’s no secret that I have fails in the kitchen more often than I’d like to admit. I figure most normal people do though, so why not just lay all the cards out on the table? Things don’t always go how you expect. And this time, with this Tiramisu Cake, it was due to a rookie mistake on my part. I am usually really good at making sure all of my ingredients are at room temperature. This is important so that all of the ingredients emulsify together and yield proper results when baking. I never mess around with this when it comes to cookie dough or cake batter, but I tend to be a bit more lax when it comes to buttercream. Even still, I usually check the ingredients to make sure they’re not rock hard. But I actually broke my favourite KitchenAid beater blade a couple of weeks ago because I tried to whip a large chunk of butter when it was still too hard. Sad times. So this time, with this mascarpone buttercream, I actually cut my butter up into cubes so it would come to room temperature faster. What I failed to do though, and ultimately what caused the issue (I think), is that I didn’t properly bring the tub of mascarpone to room temp. I didn’t even check it! I don’t know why I didn’t check it. I guess I thought it would be fine (cream cheese usually is) or that even if it was a bit stiff, it would soften up while it was whipping. What I didn’t anticipate is that the butter and mascarpone would completely curdle and separate when whipped together. Minor panic set in when I looked into the bowl. I though that surely more whipping would fix it, so I added in the sugar and whipped it to oblivion. No dice. Honestly, I almost considered using it in this state (wtf Olivia?). If we still had a grocery store close by, I would have ran out and bought new ingredients, but that wasn’t really an option here. Thankfully, I came to my senses and tried a trick to see if I could save it. A few years ago, I remember ages ago dealing with a curdled/separated meringue buttercream. I had frozen some leftover buttercream, thawed it, and started to rewhip it (which is what you should do after thawing). I guess it was still a bit too cold, because what was in my mixer looked like cottage cheese soup. I’m not even kidding you. This mascarpone frosting didn’t look quite that bad, but it just didn’t look right (or taste right). What I remembered from last time is that you just needed to warm the frosting up a bit so that it can emulsify properly. So I grabbed my trusty hair dryer and started heating up the sides of the bowl while the mascarpone buttercream was whipping. The hair dryer has saved me from more than one baking disaster. Sure enough, after heating it a bit and letting it whip some more, it came together perfectly. You can also heat the buttercream in bursts over a double boiler — whipping between heating — if you’d rather try something more professional, lol. So learn from my mistakes, people. Make sure all of your ingredients are actually at room temperature, or you’ll have some ugly curdled buttercream on your hands. But if that happens, now you know how to save it, right?? 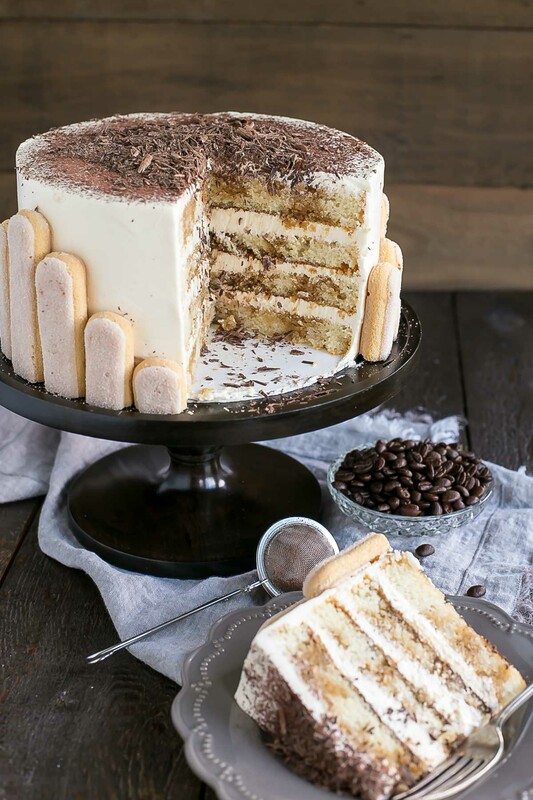 I’m not in love with how this Tiramisu Cake looks (shocker). I should have done something, anything, with the frosting on the sides. It’s too flat and boring. Ryan says it looks very art deco, which makes me like it a little bit more. Oh well, it’s the taste that matters and it tastes ridiculously delicious! Really, it tastes just like a tiramisu. 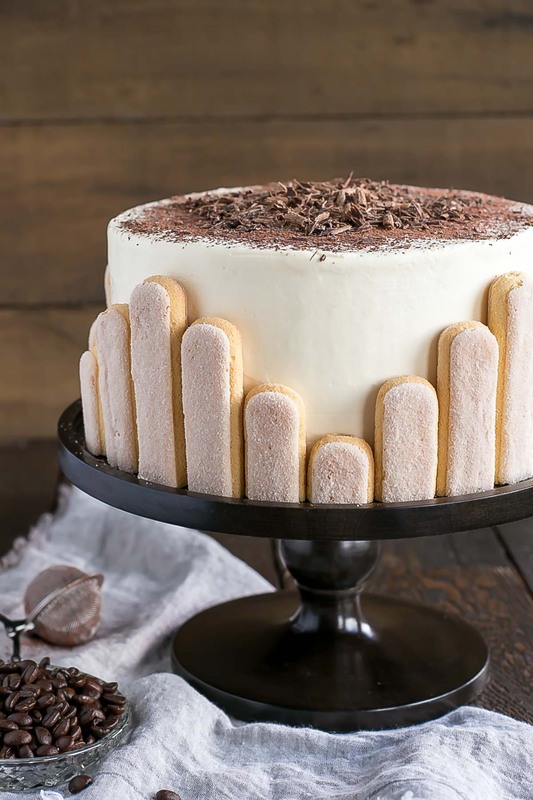 You could just have tiramisu, but this way is better because it’s a cake. Those coffee soaked layers are some of the best I’ve ever had. And the mascarpone buttercream has just the perfect balance of flavours. It’s a bit heavier than what you’d see in a traditional tiramisu, but I wanted the cake to have more structural integrity. Plus, I love a good buttercream. 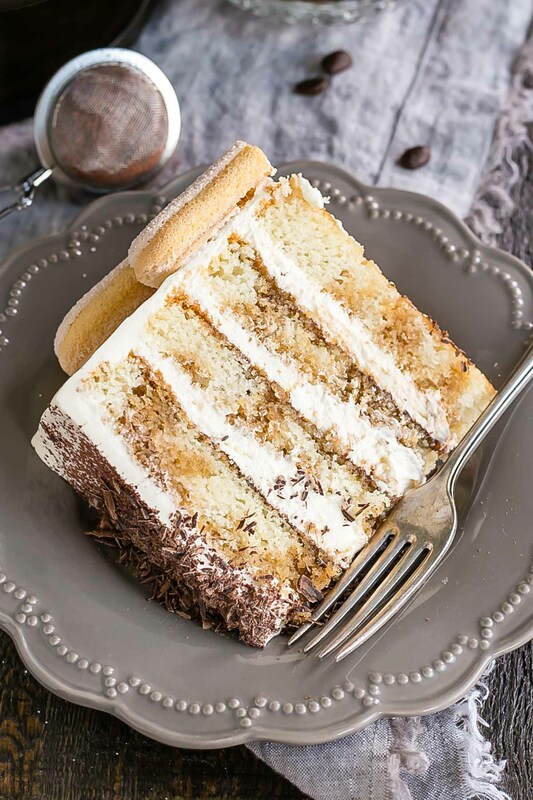 If you love tiramisu and are looking for something a little different, then this Tiramisu Cake is for you! Make sure all of your ingredients are at room temperature. Especially for the frosting, as it can curdle! See post for details. For added crunch/flavour, you can crush up some lady fingers and spread them between the layers. They will soften the longer they sit in the cake, though. I was a little too generous with the frosting between the layers (I used about 1 cup per layer). A thinner layer between each would have balanced the cake better. This would also leave enough frosting to do some piping on top. The coffee liqueur is optional – you can leave it out, and it will still taste delicious! Bring sugar, water, and espresso powder to a boil in a small pot over med-high heat. Simmer for 1min. Remove from heat and stir in coffee liqueur or rum if desired. Set aside to cool. Place cakes on wire rack to cool for 10mins then turn out onto wire rack. Cool completely. Beat butter and mascarpone until fluffy (2 mins). Add powdered sugar one cup at a time. Add vanilla and beat until fluffy (3 mins). Place one layer of cake on a cake stand or serving plate. Brush generously with about 4 Tbsp coffee syrup. Dust with cocoa powder if desired (I did). Top with approximately 3/4 cup of mascarpone buttercream and spread evenly. Repeat with remaining layers and crumb coat the cake. Chill for 20mins. Frost the cake with the remainder of the buttercream and smooth the sides and top. Dust top with cocoa powder and/or sprinkle with chocolate shavings, and press lady fingers into the sides if desired. I Just pulled this cake out of the oven, using the cake wraps (first time ever), and my cake is perfectly flat and evenly baked. I also noticed the cooking time was less than ecpected, and the top of my cake is soft, not crusted. I prefer the soft cake like top. Needless to say, I just ordered 6 more cake strips on amazon (I bake multiple cakes at a time) I LOVE THESE CAKE STRIPS. Also, this is my first try at your tirimisu cake, so far its coming out good. For the coffee syrup I added Kahlua and simmered some of the alchohol out. Ca’nt wait to taste tjis cake. I have a question, since my cake is still cooling, too soon for me to tell how dense this cake is, specifically, would it work for a sculpted cake? Im thinking this would be good for a cake im doing for my nieces sweet 16 cake. Its a 3 tiered cake, the top tier is a replica Chanel handbag with a Peony sugar flower rested next to the handbag. So the handbag is the sculpted portion, which is nothing to intricate, pretty basic as far as the cake portion goes. Anyways, your opinion would be much appreciated. Hi Cindy! Yay for the cake wraps! They are a total lifesaver. This cake uses my standard vanilla cake as a base for it and I think it would work well sculpted. 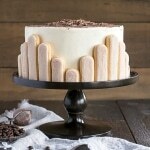 I wouldn’t torte it to 4 total layers like this tiramisu version but should work fine otherwise! Olivia, This is my “go to” Vanilla cake from this day forward. The cake baked perfectly, perfect density,, not too dense, but not too light, and best of all…. not too sweet! It tastes like a buttery vanilla cake. perfectly moist. I have a baking business, and I bake everyday. I have been trying Vanilla cake recipes for over a year, Experimenting on my own, but no success…. until today. Thank you. Oh, btw – it works fine for sculpting cakes too. Does this cake have to be refrigerated? Hi Barb! I would refrigerate it, yes. Hi! If I wanted to use espresso from my espresso maker, how much would you recommend (vs water and espresso powder)? Same amounts of sugar and liqueur for the coffee syrup? Hi Jesse! I would just use a shot of espresso and reduce the water by about the same amount. That being said, the rest of the recipe worked wonderfully. I found the cake was wonderfully light and fluffy, and the espresso syrup is seriously addictive. I ended up turning it into a latte cake, which I took to work and disappeared in a day! Hi Ellen! So interesting, thank you for sharing that info!! I’m sorry it caused you so much trouble. I had no idea mascarpone was made differently in other parts of the world — especially so drastically that it would affect a recipe. I’m so glad the rest of the recipe worked well and that you liked it. Thank you for sharing your tips! Hi Liv! I only have 1 eight inch pan. Can I bake them in two batches? If so, how long would I need to bake each batch? Hi Eliza! I wouldn’t bake them in two batches as the cake should ideally be baked right away. I mean, you can try, it might work, the second layer might just not be as good as the first :). Alternatively you can halve the recipe and make it twice. Baking time would be relatively the same, maybe slightly shorter if baking one at a time. Oh, okay! Also, your cake here seems to be the same as your basic vanilla cake recipe. Everything else is the same, but here, it says to use 2 tsp baking powder. It says 2 1/4 tsp over on the basic vanilla recipe. Which one should I use???? Hi Eliza! Use the recipe here as listed. I experiment with my cakes so they’re not always the same each time. Using and extra 1/4 tsp won’t hurt though. Hi Liv! I’m really excited to make this cake. My only question is- is it possible to make buttermilk at home? Which type did you use? Hi Ginny! You can make it at home, I do all the time! Add 1 Tbsp lemon juice or vinegar to 1 cup milk and let it sit for 10mins. I made this for Christmas last year. The recipe was pretty easy to follow but I must say temperature is everything when it comes to this cake. You really need to make sure EVERYTHING is room temperature before you use it. I had a little trouble keeping the frosting from curdling, but I used some of the helpful tips to keep it perfect! Overall, I got a lot of compliments and requests to make it again! Hi Olivia! So this is the second time I’ve tried one of your cake recipes. They are amazing, but I’ve been having problems with the cake being very dense STILL! ARGH! It becomes very tacky when eaten and sticks to the roof of your mouth. For this cake, I made sure to get new baking powder and was so sure I did not over mix. Just until each addition of whatever is called for was incorporated. And made sure everything that had to be at room temp, was at room temp. Overall, I was not able to determine dense ness until completely assembling the cake and cutting into it. Ended up having to do two layers since I did not think either was thick enough to torte. The first pan ended up dense, while the second did not, which made no sense to me, unless it was just because the second pan was thinner and was able to absorb more of the coffee syrup?? Or maybe it had something to do with the bake even strips and the evaporating water made it less dense? Or maybe it was because I took the second one out of the oven multiple times? But to recap on my questions, I have no idea why the first pan came out so dense or why the second had a slight crater. Olivia please help😖 am at the end of my wits! So sorry for the book😞 I appreciate any advice you have, and thanks for your time! Hi Tiffany! Sorry to hear about your cake troubles, I hope I can help! First — the moisture of the baking strips will make the cakes take longer to bake, so that’s nothing to worry about. The center being deflated leads me to believe the cake was take out too early which could cause it to collapse. My first test when checking for done-ness is to give the pans a very slight nudge in the oven. If there is any jiggle at all, I leave them in there another 5 mins. I never actually take the pans OUT until I’m sure they are 100% done. This could also have contributed to it being shorter than the first. Was each of the pans baked from a separate batch of batter? If not, they should be baked at the same time (one should not be sitting out while the other bakes). I’m not sure that’s what you did, but I thought I’d call that out. 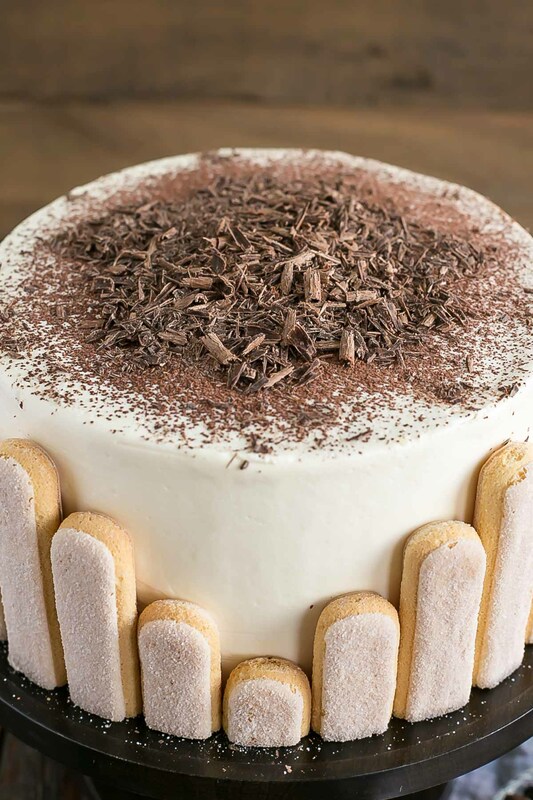 Finally, for this recipe, my cake layers were not very tall — about 1.5″ or so — you can see the torted layers are quite thin, but I wanted it that way to more emulate the tiramisu. I wonder if the gummy texture is due to too much of the syrup being added on top of the layers? That would cause them to get more dense and potentially a bit soggy. I’m not sure if any of this was helpful, but I hope so! Please keep me posted on how things go next time. Hi! i wanted to make a sample of this cake. if i cut the recipe in half would it better fit in a 6 inch or a 4 inch round pan thats 3 inches deep? Hi Zunaira! Converting pan sizes is always tricky. 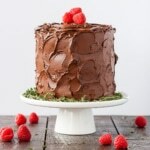 Here’s a site I use as a guideline: http://www.joyofbaking.com/PanSizes.html I think a 4″ would be too small. I made half the cake, and it was perfect for one 6″ – 3″ deep round pan! it came out to approximately 1.5 lbs (which is how much i usually put in a 6″ pan). I’m planning on making this cake soon but could only find instant coffee at my grocery store. Do I need to use espresso powder or could I use instant coffee? Hi Hannah! Instant coffee won’t be as strong as espresso powder, so I would use more of it (maybe 3x more). Otherwise it should work fine! 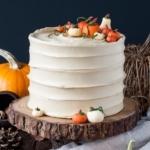 I am planning on making this cake for my family’s thanksgiving, however I am short on time the days prior due to work. If I were to bake the cakes on a Tuesday night, and then make the icing and assemble on a Wednesday night to severe Thursday, do you think I will have a problem keeping everything fresh? Any recommendations on ways to make and store this cake for 1-2 days? Hi Cassandra! I think you will be fine, especially since the layers will be soaked in the coffee syrup — that will help prevent the cake from being dry. I would wrap the layers in plastic wrap and freeze overnight (the freezer helps lock in moisture). Take out 1-2 hours before you plan to assemble, then store the assembled cake in the fridge. Just omitted sugar in brewed coffe, just perfect. Made it for my friend’s bday party, everyone loved it. And I think it will hold dondant. So happy to hear that you liked it Nina! Cake for a college graduation. I’m thinking I’m. Going to need to at least double it. What’s your suggesting on doubling or possible tripling the recipe? Also do you think I should be adjust mint the temperature and bake time as well? It’s been awhile since I have done a sheet cake so I don’t want it to come out dry. I will let you know the outcome! Hi, Liv! I was wondering how I would make this recipe (cake mixture) for high altitude..if you know how to! I just recently moved from sea level to the mountains, so baking is still tricky for me 🙁 I would love to make this for work! Absolutely agree with Ryan. Very art deco and very beautiful. Sometimes simplicity is the best strategy for presentation and this works to perfection. Now to make it for myself – presentation is very much my thing, cake baking isn’t… yet! I’ve made this cake twice now, its a wonderful recipe and gets great feedback. 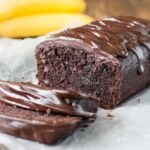 For this cake, I would strongly suggest to add the mascarpone cheese (cold) at the end for the icing, once all other ingredients are mixed well, to prevent the mascarpone from splitting. I am having trouble getting the cake to rise, I keep getting very flat layers, minimal rise, any suggestions? I’m using correct temperatures and fresh ingredients, the only thing I can think is I’m using an electric hand mixer…. The cold mascarpone is what caused mine to split actually, I had to heat it up for it to come together. For the flatter layers — is it possible you’re overmixing the cake batter? That can cause cakes to bake flat and dense. Only mix until the flour is just incorporated. Hi Olivia, I was thinking her cake isn’t rising her baking powder could be off. Once baking powder goes off, no rise will happen. Yes good point! That could be a culprit too. Hi! Do you know how to make this for a 10 inch cake? If I doubled the recipe, would that give me enough batter for 1 or 2 layers? Thanks! Hi Alyssa! 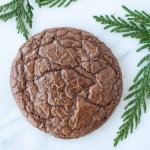 I’m not 100% sure, but according to this site (http://www.joyofbaking.com/PanSizes.html) it looks like if you double it it should work for two 10″ layers. Thanks so much! One more question, sorry! How is the texture of the cake? Is it on the denser or lighter side? I just want to make sure it isn’t like a pound cake texture? The person I’m making it for isn’t a fan of that lol. 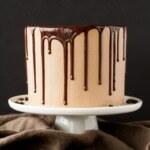 Do you think the layers would stay moist if refrigerated wrapped in plastic wrap overnight? I guess that’s two questions haha. How deep should the 8″ round cake pan be? I have two but they are only about 1″ 3/4 deep. Hi Katherine! Mine are 2″ tall and the cakes bake almost to the top. I suspect 1 3/4″ would be close, you can give it a try! Hello! I am making this cake 2 days in advance. Can I make the buttercream 2 days in advance as well? With 2 days in between baking and eating, should I refrigerate the cake layers or freeze? Or could I assemble the cake 2 days in advance and refrigerate the whole thing? Hi Elizabeth! Yes you can make everything in advance. Ideally freeze the cake layers as the fridge tends to dry them out. Buttercream can be refrigerated but will need to be rewhipped once it’s at room temp again. You could also assemble all 2 days in advance, and refrigerate or freeze. The syrup helps keep the layers moist, so drying out shouldnt be as much of an issue with this one. This turned out really well, thanks for the recipe! So happy to hear that you liked it Katherine! Hi… I want to make this in a 12″ x 3″ round pan. What would be the new measurements? Hi! I am a new baker so though ur receipt is looking great mine turn out a disaster 🙁 The mixture turns into an oil flood and theres barely enough flour. I’m sure i follow the measurements step by step, do you think it would be problems related to me using the metric system or over-whisking? Hi Stephanie! Sorry to hear you had trouble with this one. I have not verified the metric measurements as they are automatically calculated. They seem correct though… But the cake mixture should be quite thick, so something must have been off. What do you mean by oil flood? There is no oil in the cake. I really want to make this recipe, it looks amazing!! However, I only have 6- inch pans. Can I use the same batter in 3 6-inch pans instead of 2 8-inch pans and would the cooking time be different? Hi Kat! Yes, it should work fine in three 6″ pans. Baking time would be relatively the same. Let me know how it turns out! The pan you suggested is 8inch by 2inch? Then you cut in half making layers of 1 inch? Which tool you use to cut the cakes? 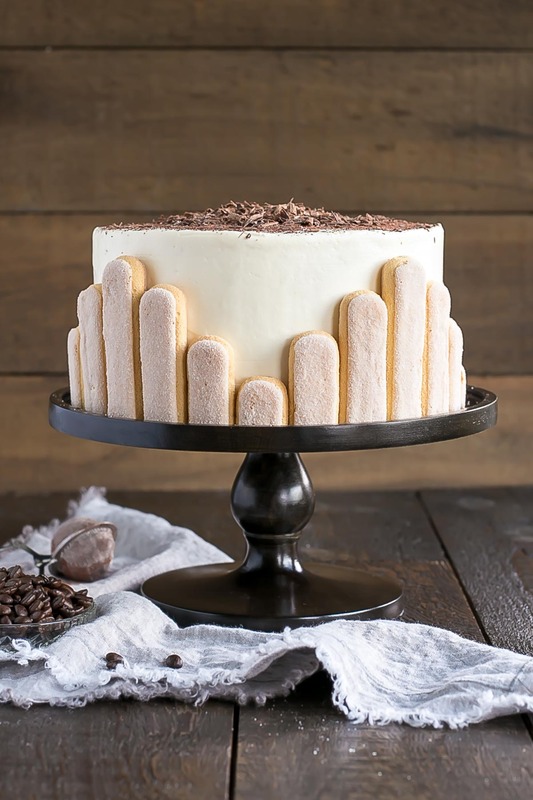 I know I’m a bit late on this, but after searching for tiramisu layer cake recipes online, I’m so glad one of my favourite bloggers has come up with the goods–it looks perfect. I’ve also brought mine back to life by warming… taking a big scoop out, melting it, and beating it into the curdled mess. Definitely trying the hairdryer trick next time! Question: I am going to make this cake today & serve it tomorrow, where should I store it? Hi Maylen! Store it in the fridge and take it out 2 hours or so before serving so it can come to room temperature. Hi Olivia, I was curious if I could make the cake a day before and assemble the day of the party. It is my step dads birthday this week and we will be too busy setting up the party the day of to make the entire cake. Hi Jessica! Totally! You could actually make the entire cake the day before and just store it in the fridge. Take out about 2-3 hours before serving. For sure though, the cake layers themselves can be baked a day ahead. Just cover them well in plastic wrap once cooled. Thank you so much Olivia for this delicious recipe. I made this cake for my cousin’s 21st b’day. It was a huge hit! 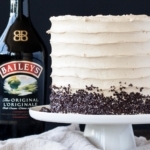 Since I am also a lover of Baileys Irish cream I just had to make your coffee buttercream also from ‘Coffee and Baileys cake’. Best decision ever. Looks delicious! Will have to try. I hope you like it Marsha! I should probably invest in some 8 inch cake rounds. I have every other size. For some reason every time I am ready to buy an 8 inch round cake pan, they seem super flimsy. People love Wilton, but they’re just so cheaply made. My favorite pans that I’ve purchased are some brand I’ve never heard of from Tuesday Morning (a cute shop that sells things pretty cheap). Anyway, that being said, I wanted to see if you’ve tried this in 9inch cake pans. I’ve done this before with different recipes, but wasn’t sure if this particular one will work? This recipe will work in 9″ cake pans, but the layers will be a bit thinner so you may not be able to cut them in half. I would suggest maybe baking it in three 9″ cake pans (if you have 3), and making a 3 layer cake instead. Let me know how it turns out! Yes! I do have 3 pans. Will definitely try that out instead of making it with 2 and cutting. And this way enough frosting to go around. Also, I’ve already bought the lady fingers off Amazon and they arrived this weekend. I am making this for my husband’s 29th birthday on Wednesday. So excited!! Will definitely let you know how well it turns out. Making it in 9inch pans turned out GREAT! It was absolutely delish and my husband LOVED it. We’re only 2 people, and we won’t finish an entire cake, so I took the rest to work and shared with my co-workers. They’re quite in love with it. My only question is how do you make your cakes SO smooth? Yay! So glad you guys liked it!! I use this tool on the sides of the cake to make the frosting smooth: http://amzn.to/2wYpymK. It works amazingly well! Is there any chance this cake would freeze? I’m needing/wanting a cake that will freeze for a couple of weeks and this one looks so delicious! Hi Katya! This cake should freeze pretty well. Let me know how it turns out! Hello Olivia! I am also going to refrigerate my cake for a few days before I ice and decorate it and am wondering if you would suggest I put the coffee syrup on before or after? Hi Kristen! 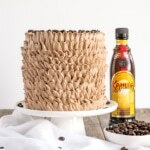 I would put the coffee syrup on the layers just before you frost the whole cake. Since you’re not assembling the cake right away, I’d recommend freezing the cake layers (refrigerating will dry them out). I wrap mine tightly in plastic wrap and freeze until I’m ready to use them. Then just thaw for an hour or so. I hope that helps! Hi Suhail, it should be available now. Gorgeous! It definitely has an art deco, old Hollywood look to it. Love the tip with the hair dryer and totally get the having your ingredients at room temperature. Who has the time, though, sometimes?!? I’m sure it tastes amazing! I know! Seriously. I am notorious for forgetting to take my eggs out, but those can be quickly brought to room temp in some hot water. Butter though? Ugh. Great recipe! I used 2-6 inch round pans and 2-6 inch square pans, in order to make 2 smaller cakes for 2 couples. There was plenty of batter to do this without having to double. The only tip I would pass on is, make sure you are VERY generous with the coffee syrup when you brush it on, mine was a little skimpy, but it was still a wonderful ! I made some quick ganache to add a little more flair to the top and I also brushed the ladyfingers with coffee syrup. Delicious. Thanks! How long did the cakes bake using the 6 inch round pans? I am new to baking and wanted to use smaller pans, but am not sure about the “conversion” required. Thanks! Hi Courtney! They will take about 35-40mins to bake or so. I hope you like it! Wow! This is definitely on my list to try. Thank you! I too have had the cottage cheese curdled buttercream, I took a bowl full out, heated it briefly in the microwave and reincorporated it. Perfect end result! This looks delish! I’m not a cake baker so sorry for this question, does one brush the syrup on the cut side of the cakes or on the smoother side or does it matter? Thanks in advance! Hi Thea! That’s a great question actually. It’s best to brush it on the cut side of the cake so that the coffee syrup can soak into the cake better. Looks beautiful! I didn’t know that about warming the icing to save it- really appreciate the tip! Gracias por compartir recetas tan espectaculares. Me encantan y las disfruto muchísimo. Hice la torta moca y fue éxito total. Lo que sí he hecho es bajar la cantidad de azúcar. Aquí en Colombia nos piden bajar el dulce en las recetas de tortas. Esta de tiramisú si la hago creo que sólo le dajaria una taza de azúcar. This cake looks fantastic! My question is, do these cake layers rise to the top of the pans? I always use Fat Daddio’s 8×2 pans. My cakes never seem to rise the full 2″ so my layers look so skimpy when I torte them. Any advice? Thank you Olivia for such a quick response, I gotta give this beauty a try! Hi Olivia, I am having trouble with the cakes rising. Do the pans need to be lined up the sides as well, or just the bottom? Hi Tam! I only line the bottoms. The cakes don’t rise a huge amount, but they should rise. Is it possible that your baking powder is expired?